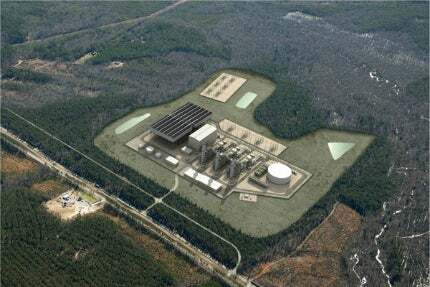 The 1,358MW Brunswick County gas-fired power station is located near Lawrenceville in Brunswick County, Virginia, US. Image: courtesy of Fluor. The plant is equipped with three M501GAC gas turbines, each with a power generation capacity of 276MW. Image: courtesy of Mitsubishi Heavy Industries (MHI). Alstom provided heat recovery steam generators (HRSGs) for the combined-cycle power plant. Image: courtesy of Alstom. More than 1,000t of hot-dip galvanised structural steel was used in the corrosion control system, which was supplied by Galvan Industries. Image: courtesy of Galvan Industries. Dominion Virginia Power developed a new 1,358MW natural gas-fired power station near Lawrenceville in Brunswick County, Virginia, US. The project is expected to generate approximately $824m in economic benefits for the state, and will replace two retiring coal-fired power stations in eastern Virginia. Virginia State Corporation Commission permitted Dominion for the power station construction in August 2013. The groundbreaking ceremony for the project was held in May 2015. The plant began its operations in April 2016 and was officially completed in June 2016. The $1.3bn power project produces electricity that is sufficient to power 340,000 homes. The plant created 380 jobs during construction, and 43 permanent jobs. Plains End is the world’s largest natural gas-fired peaking power plant. The natural gas-fired, combined-cycle power station is located on a 214-acre site in Freeman, Virginia, approximately eight miles east of the town of Lawrenceville. The plant is equipped with three M501GAC gas turbines and one steam turbine. With a power output of 276MW each, the gas turbines were manufactured at and shipped from the Savannah Machinery Works factory (Georgia), which is operated by Mitsubishi Heavy Industries (MHI). The M501GAC gas turbine is one of the world’s most efficient and large-capacity 60Hz gas turbines and is far more flexible than a steam-cooled unit due to faster ramping, faster start-up and lower emissions. Equipped with an air-cooled durative of the G Series model, the gas turbine provides greater power output and higher efficiency than the F-class gas turbines. The heated air from the combustion turbines is captured and passed through the heat recovery steam generators (HRSG) to create steam that spins another turbine to produce an additional 550MW of electricity. The HRSG units incorporate Alstom’s optimised for cycle and constructability (OCC) design, which increases the plant’s performance during gas plant cycling while lowering the construction costs. The HRSGs are equipped with selective catalytic reduction (SCR) and carbon monoxide catalyst technology, which helps in reducing emissions from the plant. More than 1,000t of structural steel has been hot-dip galvanised by Galvan, to guard against corrosion for decades with little or no required maintenance. Natural gas for the project is supplied by Williams from its Transco natural gas pipeline, which was developed under the Virginia Southside Expansion that involves an extension of the existing Transco pipeline facilities to increase the supply capacity by 270,000DTH a day. The plant is connected to the grid through two new electric transmission lines and a new switching station along the existing Carson-Clover transmission line. A new double-circuit, 500kV line, on the south-eastern side of power station, utilising the existing Carson-Wake 570 Line, and a new single-circuit, 500kV line, on the north-western side of the power station, connecting to the existing Carson-Clover 556 Line were constructed for this purpose. Fluor Corporation was awarded the engineering, procurement and construction contract for the project. Mitsubishi Power Systems Americas (MPSA), a wholly owned subsidiary of MHI, was awarded the contract to supply three M501GAC gas turbines and one steam turbine for the project. The contractual scope included comprehensive turbine maintenance, repair and outage services, replacement parts supply, and dedicated remote monitoring for the gas turbines. Alstom is the supplier of heat recovery steam generators (HRSGs). MACOGA was contracted for the design and supply of large expansion joints. Dave Steel is the steel fabricator, while Galvan Industries was engaged to provide the corrosion control system.